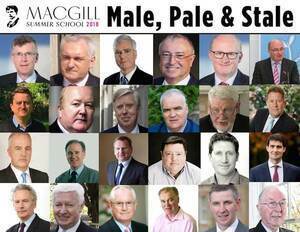 Further to yesterday’s gender imbalanced MacGill Summer School line-up. 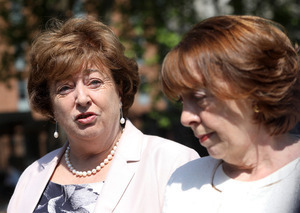 The Social Democrats Co-Leaders Catherine Murphy and Róisín Shortall have said they will withdraw from their respective panels at this year’s MacGill Summer School unless significant changes are made to the gender-balance of panels across all sessions. “I find the comment from the organisers about it being ‘difficult to find people with the right aptitude’ quite offensive when the implication is obviously that that is the reason more women are not invited to speak at the event. Posted in Misc and tagged MacGill Summer School 2018 at 10:27 am on June 20, 2018 by Bodger. There are 56 speakers total. 12 are women and 44 are men. 21.4% of the speakers are women. 22.1% of members of the Dáil are women. It’s poor, but they’re comparable. Perhaps they will withdraw from the Dáil until it has a better proportion of representation? Never waste a good identity politics row to signal your virtues. Best part of this sort of comment is that it concedes that the argument is virtuous. Nigel, would you please refrain from commenting on this site as your overtly male presence is tipping the delicate gender balance in the *wrong* direction. You should see what happens when he flexes his muscles. Never knew anyone sexually imprinted on Mickey Rooney before but I don’t judge. BRB off to turn McGill woke AF. You seem upset, need a hug hun? Its not the gender that annoys me as much as the selection…. Its always the people who were in charge of wrecking the country that lecture us about wrecking the country. They make a living from this stuff! He see, this is what that Joe Mulholland specialised in. Creating the gang. The lads. The acolytes. They were the sneaky ones. The bullies friend, and they went after anyone Joe didn’t want around. Just like they are doing on this comment board. That is old Joe Mulholland’s legacy. Watch and learn. See how it works. jesus there’s a right line-up of fuppers. Phil Hogan, Bertie Ahern, David Quinn, Jack Chambers??? (completely insane little right winger) .. Who the hell would wnat to hear what any of them have to say unless it’s a confession. There’s also like 40 of them, I could easily list a bunch of women who would be far better than .. fupping bertie a-fupping-herne. Why the hell is he ever asked his opinion on anything? he has blood on his hands, he destroyed the country entirely, and lives were lost because of it. but hey let’s hear him do a speech! i really hate this country sometimes. Le Pen would be good. It’s the idea that these guys have some kind of aptitude that simply cannot be equalled by any woman they could think of when sending invitations. And this seems so obvious to them that they’re content to explain using it. I mean, they haven’t even the wit to see how it sounds. And where are the protests from the men? They’re all happy enough, couldn’t give an arse if they’re on a panel without a single woman on it. Then when you notice complete a s s hats like David Quinn in there! Ugh…that guy is repulsive. There’s Bertie there too, thats what we need. Some wise words from the fupper who wrecked the country in 2008, a catastrophe that actually caused many deaths and thousands emmigrating. Well done sir! You are exceptional! That’s who Joe Mulholland is. All his old political friends. The ones he bowed to and gave airtime to. Why are opus dia always on telly, thanks Joe. The old boy network Laid bare. Bertie Ahern and Pat Cox. wtf! Is this 2002. Fair play to the leaders for Social Democrats. That’s exactly how to make a stand. Women still need to call out the misogynistic establishment that are at the higher level of Irish society in the guise of media commerce law and politics. It’s not tools at the bar and sports clubs that are the problem. They are a problem, no doubt. But have no doubt the real deep seethed misogyny is laid down by rich men in suits. The ones with power. The ones with white collars. The priests the bankers and the politicians. They really really hate women. They are women’s problem for progression in this country. They are the blue collar workers problem for progression in this country. They are the real artists and the creative peoples problem for progression in this country. They are the nurses care workers and our sick barrier for any kind of reasonable life in this backward ramshackle of a Republic. There are more than enough women ( in fact there is more women than men) to run the country. If they speak and act on behalf of the majority of the people. All the people that don’t have a voice. Not just Irish women. In the last election I voted for a woman. I didn’t vote for the woman though. I voted for the party. I voted for Sinn Fein because in my constituency of Offaly I wanted to see the end of establishment parties. Establishment parties that see women as second class citizens. FF and FG have proven beyond doubt that misogyny is at the core of their party ethos. The hidden paragraph that is not in writing. The one thats not visible but can be felt up and down the corridors of political religious and corporate power. Systematically FF and FG propped each other up in government. For who? The Irish people? It was all for the Catholic Church and the 2 main political parties of the establishment FF & FG that gave the Catholic Church autonomy of our hospitals and schools. They raped our children aswell. They still live among us free to do what they want because they are protected by the establishment. The legal system doesn’t want to rock the boat either. The establishment parties make sure to look after them with massive money gigs such as Disclosure Tribunal. Where one thing will certainly not be disclosed. The real truth. And no one gets convicted. The hypocrisy is rank from these government parties. Even though FF aren’t in government they still hold the sway of power. How boo bood up is that. The only way Ireland can really move forward is to vote in a completely new government. I voted for SInn Fein in the last election . I didn’t vote for Carol Nolan because she was a woman. I voted for her because she wasn’t FF FG or Labour. If I had someone like Clare Daly Catherine Connolly Joan Collins Ruth Coppinger Brid Smith Catherine Murphy or Róisín Shortall would have given my Number 1 to a strong independent woman who works for everyone. But hopefully there will be more of a choice next time. Because these women are prime examples of how great and honest our Republic can be. The next government should be made up of women and men who work as hard as the women listed above. If Mary Lou and SInn Fein really want to be in government and really want to move Ireland forward they should only consider going into government with everybody apart from Fianna Fáil and Fine Gael. They will get the numbers. So that’s what they need to be saying to the electorate right now. Anything else is an insult to Irish people. And Irish people don’t be insulted. Don’t vote for a woman because she is a woman. Vote for the best candidate. I can not understand for the life of me why any woman would vote for, let alone join a party such as Fine Gael and Fianna Fáil. This is 2018 people. Haven’t we suffered enough under the hands of these establishment draconian barbaric and sadistic shower o sillies. The final nail in the coffin of our shameful history can be viewed tonight on OUR network RTE 1. Don’t mourn or feel sad for our strong Irish women. Just honour them and their memory and be the change that they fought so damn hard for. And remember not all men are bastards. But the ones with power are the ones to keep an eye on, most of all. So raise a smile for the evil medieval McGill and who they don’t represent. Just walk tall and move forward towards a more equal and inclusive Ireland. And boo boo the begrudges.